It is so amazing to look at my blog statistics. I remember when I started blogging I had no idea what blogging was and what you do when you blog. Yea, I was a bit ignorant to that side of the fence. So, here I was unemployed, depress, broke with no way out. Being 20 something, you wonder why I just get a job waitressing or something. Well, it’s a bit more complicated than that. My story entails a lot of interesting but sorrowful details. I have always wanted to be successful, that was my aim. I love to cook, and I love fashion, so I thought to become a fashion designer and a restaurateur. But how much can you do with so little money? Sad! But guess what I did, I prayed. Yes, I prayed so hard I said God please I am begging you show me a sign, I am tired and hopeless I need a breakthrough. What we fail to realise is that sometimes our problems are so hard we believe that we have the worse life and going through the worst situations. But there is always someone who is worse off than you, trust me. One day while searching Pinterest which I had no idea how to use, I discovered blogging. I believe it was a pin from Chasing Foxes on how she used blogging to make thousands. It took me couple days to finally say I am just gonna shut my eyes and pay for my domain and hosting from HOSTGATOR, luckily I got a ridiculous discount and ended paying only $36 for everything. Believe me; HOSTGATOR gives crazy discounts. You can self-host your blog for little or nothing. They are amazing; I love Hostgator, have never had a problem with them at all since I have been blogging. They keep you updated and with 24hr customer service. They offer great help with SEOs and ways to maximise your potential. They do provide an affiliate program so you can definitely make money with Hostgator by recommending a friend. Just don’t delay sign up with HOSTGATOR soon as possible, don’t be the one to be sobbing a few months later, wishing you had started your blog. You know that few months down the line you could be making $1,000 a month or more. With HOSTGATOR it’s easy and cheap, guarantee you can’t find a better deal. This is my 4th-month Blogging, Yippy! I am currently around 75,000-page views for March; my page views increase drastically. However, what I did wrong was to focus on pageviews rather than monetizing my blog. I thought with page views then I would exactly be making more money. WELL NO! That’s not how it works. Page views are SQUAT!!! 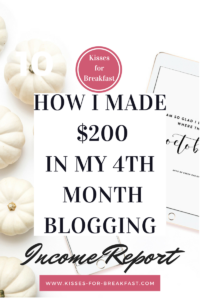 Without a proper strategy to monetize your blog. I am still currently figuring out what works for me and what doesn’t. If you like to know how what I did to increase my page views. Check out my article here. I only focus on Pinterest seeing that I get most of the traffic there and Occasionally Facebook and Instagram. I actually do love Instagram it’s fun. Again Twitter I do not pay attention to, I still laugh at a number of followers I have. I have stopped using Facebook during Lent. Lent ends on the 13th of April. 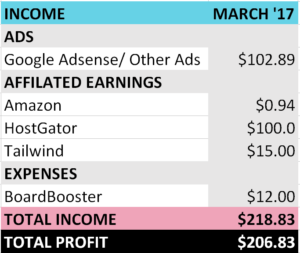 Last month I recalled stating that my goal is to make $500 by April. I am still working on that goal. Let’s see how it goes. I am planning on buying an affiliate course to help with my affiliate income. As you can see I am struggling in that department. Increase my email subscribers. I currently have over 100 subbys woot-woot! Thanks to my subscribers. My aim this month is to double that. I also plan to create a free product and a product to sell. Currently working on that too. Increase my page views. This is a never ending job. So proud of you!!! Keep up the great work. Thank you so much Fonnique. Thanks, Hana I am indeed working on it.